Aritaum | May our skin grow beautiful, as we grow wiser. 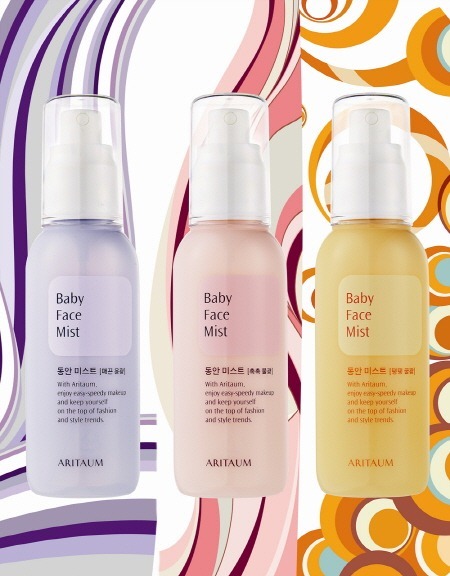 Amore Pacific’s Aritaum will be releasing three new face mist called the Aritaum Baby Face Mist. These face mists contains hyaluronic acid to provide intensive hydration to the skin, and bamboo sap which works deep in skin layers to attract and retain moisture as well as a skin-healer. It will be available in three versions. Firms the skin, increase the production of collagen to give you smooth and firm baby skin! This coming spring, Amore Pacific will be revealing their Spring makeup collection under the brand Aritaum. The line will be called Pinkland. Of course, the BB Cream and Balm will be a pudding texture. The primer can be an all-in-one item combining your lotion, essence, moisture cream. The line consists of Rose Water and Vitamin B as their main ingredients. To purchase search for 화이트 푸딩 BB크림 ( BB Cream ) , 푸딩 틴트 립밤 ( lip balm ) , 원스텝 프라이머 푸딩 밤 ( primer ) , 팽크랜드 피니시 팩트 ( pact ).